Understanding what causes this injury, and the proper ways to treat and prevent it can help to keep your shoulder pain free. Impingement syndrome is irritation of the soft tissues of the shoulder, the rotator cuff and subacromial bursa. These soft tissues are often caught between the humerus and the acromion, causing an irritation of the tissues and an inflammatory response. This impingement is most common with motions that occur overhead, or above shoulder level. The shoulder is an inherently unstable joint. One look at the articulation between the humerus and the glenoid and you can see that there is very little bony stability. While the shoulder is referred to as a "ball and socket" joint, the socket or glenoid is very shallow, and does not surround the humerus. We sacrifice stability in order to gain mobility. 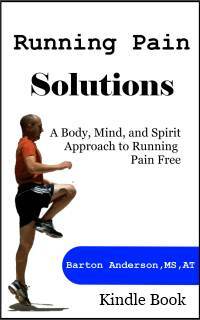 This allows for a greater range of motion throughout many different planes. Stability of the shoulder joint depends on two factors. Static and dynamic stabilizers. The goal of both the static and dynamic stabilizers is to keep the humeral head centered on the glenoid during activities. The static stabilizers are the joint capsule, and the areas of thickening often referred to as ligaments. 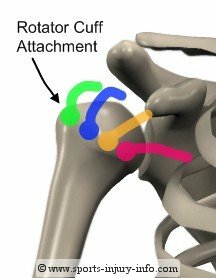 Together, these ligaments and the capsule help to hold the humeral head centered on the glenoid. The glenoid labrum also contributes to static stability. The labrum is a ring of fibrocartilage that surrounds the edge of the socket, and actually increases the overall depth of the glenoid by up to 70%. This improves the contact area between the humerus and the glenoid, increasing stability. Dynamic stability refers to stability during activity, and is provided by the rotator cuff muscles. The four cuff muscles all work together to keep the humerus centered in the socket during movement and athletic activities. Another very important function is the depression of the humeral head during overhead activity. This depression helps to keep the humerus from hitting the acromion, and impinging on the soft tissues. There are many different factors that can contribute to impingement syndrome. One of the most common is overuse. Athletes who participate in overhead throwing sports can often suffer from impingement syndrome due to overuse of the shoulder. Pitchers are especially susceptible to this. As the shoulder performs repetitive overhead movements, the rotator cuff muscles become fatigued, and thus the dynamic stability is reduced. 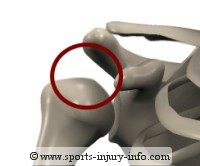 As this happens, more movement of the humeral head within the shoulder joint occurs. As this movement increases, soft tissues between the humerus and acromion become impinged, leading to an irritation and inflammatory response. This can lead to a viscious cycle, as the inflammation and irritation decreases the effectiveness of the muscles, allowing for more movement and impingement, making your shoulder pain worse. In addition to overuse, muscular imbalance is also another factor in impingement syndrome. 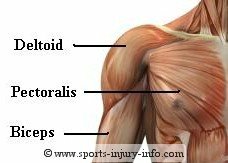 The muscles that attach to the front of the shoulder are much larger and often tighter than those on the back. The pectoralis major and minor, subscapularis, biceps, and anterior deltoid all attach to the front of the humerus, versus the two small posterior rotator cuff muscles the infraspinatus and teres minor. Because of this imbalance, the humeral head is often pulled forward, and is unable to maintain a centered position in the glenoid. If you recall, stability of the shoulder joint relies on centering of the humeral head on the glenoid. 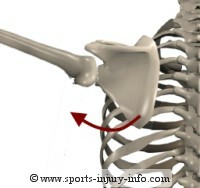 As this centering is decreased, effective function of the shoulder decreases, and predisposes the athlete to injury. In addition to stability of the humerus and the glenoid, stability of the shoulder blade (scapula) is also very important. During normal shoulder function, the shoulder blade rotates on the body as you move your arm up over your head. 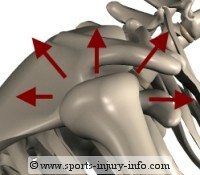 This rotation must occur in order for the shoulder to function properly. Since there is no bony connection between the shoulder blade and the trunk, the scapula relies solely on muscles to keep it stable and rotating correctly. Think about the scapula as the foundation of a house. Without a stable foundation, the rest of the house is likely to fall down. The same is true with the shoulder. Without a stable scapula, the humerus has no base on which to attach to securely. All of these factors can contribute to impingement syndrome. Shoulder impingement is a complex injury, with many different factors. However, the symptoms are similiar, depending on the severity of the problem. The most common complaint is pain and discomfort with overhead motions. In early stages, you will have an achey pain with overhead activities. This often subsides after the activity is finished, but may last into the next day. As this injury progresses, pain begins to accompany any type of overhead motion, including daily activities like reaching up to open a cabinet, or washing your hair. 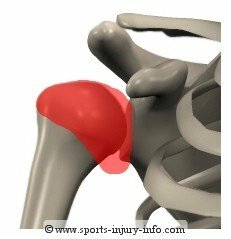 As inflammation of the shoulder increases, impingement syndrome can lead to a loss of range of motion, either due to pain, or a tightening of the joint capsule. You may have trouble sleeping at night, unable to find a comfortable position. You may also have a burning sensation that radiates into the upper arm and forearm. There may be numbness or tingling feelings in the arm and hand. Popping, clicking, or catching of the shoulder with movement can also be a common complaint. If you are suffering from shoulder impingement, there are several things that can be done in order to reduce your pain and discomfort. Rest from aggravating activities as well as using ice several times a day, and the use of an anti-inflammatory medication can help. Resting allows the shoulder inflammation to calm down by removing the irritating stresses from the tissues. As inflammation decreases, pain decreases. The use of ice helps to decrease inflammation, as well as reducing pain and discomfort. However, treating the symptoms is not enough, and some type of rehabilitation is necessary. 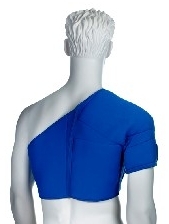 One of the best ways to ice the shoulder is using an ice compression wrap. It provides a great way to cover the entire shoulder, without dealing with an ice bag or the mess that goes with it. The compression allows for deeper penetration of the cold. Using an ice compression wrap several times a day can significantly decrease your pain. Because impingement syndrome is a complex injury, with many different possible causes, for the most effective treatment, you should see your family physician or certified athletic trainer. They will be able to determine the exact cause of your impingement syndrome, and provide recommendations for treatment. In severe or persistant cases, an injection into the shoulder may be necessary. For those that don't respond well to rehab, surgery to decompress the shoulder may be necessary. Rehabilitation for impingement syndrome often focuses on strengthening of the rotator cuff muscles and the scapular stabilizers, as well as increasing flexibility of the anterior muscles of the shoulder. Capsular stretching and joint mobilizations can also be effective in treating impingement syndrome. A good rotator cuff training program could be the answer to your pain and discomfort. Sometimes, just a little guidance is all that is needed to reverse shoulder pain and to reduce shoulder impingement. If you are suffering from any of the above symptoms, check out The Ultimate Rotator Cuff Training Guide. Developed by a practicing Physical Therapist and Certified Strength and Conditioning Specialist, it is the best home exercise program available online to help treat your shoulder pain. Quality information is my goal, so this recommendation isn't taken lightly. Impingement syndrome can be a frustrating and chronic injury if not treated correctly. If you are having shoulder pain that keeps you awake at night, or that is affecting your athletic performance, you should seek medical help. While resting may decrease your pain, without treating the underlying cause, return to activity will likely result in a return of pain. Impingement syndrome often gets worse with time. So see your physician or certified athletic trainer sooner than later. Your shoulder will thank you for it.